During the first quarter of the nineteenth century, when the primeval forests of northwest Pennsylvania were slowly yielding to the pioneers’ axe, a few resolute Catholic families with a desire of bettering their condition, and acquiring an independence, not then enjoyed by them were urged to leave their respective and comparatively civilized homes. They were to go where no one had been before them, to improve uncultivated nature and convert the wilderness into the peaceful, productive, agricultural region, which is now our heritage to enjoy. No sooner had these sturdy and upright Catholics erected their log cabins, applied the axe to the forests and the shear to the virgin soil, than the indefatigable missionary appeared among them to minister to their spiritual needs. From the names found in the parish books, some of the early pioneer Catholic settlers were Irish. One of the descendants of those families is listed as being honored with a Judicial office in 1917 in the city of Pittsburgh, the Honorable Ambrose P. Reid. It is definitely known however that some of the early settlers were members of the following families: George Fidel, F.X. Guth, Leopold Guth, George Hartle, Michael Heinrich, Joseph Hepinger, Lawrence Herman, Joseph Hoentanner, John Meisenger, Peter Rapp, Bernard Reid, James Sweeney, and Nicholas Tritisch. The Church had a humble beginning. In 1842 there were six families and five individuals. During these early years the spiritual needs of the faithful were administered by the priests from the neighboring parishes of St. Michael’s of Fryburg and St. Joseph’s of Lucinda. Some idea of the meager traveling facilities and the wide extension of Catholic mission territory under his charge, can be conceived from the fact that the Reverend Joseph Cody, of Sugar Creek, Armstrong County, Pa. came only once every two or three months to hold divine service and to attend to the wants of his scattered faithful. It was necessary to hold these services in the private homes of the various members. The first mass on record was celebrated in 1842 in the home of Joseph Kelly located on Third Avenue between Main and Wood St. (then called Beck St.). Later masses were said in the homes of Mr. Bernard Reid and Mr. James Kerr. This mission in the vicinity of Clarion borough was successively supplied by the Reverend Fathers Robert Kleinediam, Peter Brown and Hugh P. Gallagher. One of these, Rev. H.P. Gallagher of Butler, delivered an eloquent temperance lecture in the Court House, and also a clear exposition of Catholic doctrines, then so little understood here, which elicited most favorable comment. Prior to this time, a lot was purchased for ninety dollars by Bishop Francis Kenrick, of the Diocese of Philadelphia, in trust for the future congregation. This lot was entered as No. 20 on the Clarion Borough Plan of Lots and conveyed by the Commissioners January 8, 1841, on page 21 of the Clarion County Deed Book. Clarion was a part of the Philadelphia Diocese until May 13, 1843, when the Diocese of Pittsburgh was founded and Michael O’Conner was consecrated as its first Bishop. In 1846 Rev. P. John Hoy was sent out by Bishop O’Conner as the first resident pastor of Clarion. Clarion however was only the central of a number of outlying missions which he attended. The severe winters, bad roads, with many privations and discomforts gradually undermined his health; his place was taken by Joseph F. Deane in June, 1847. Father Deane was in charge of the mission and its area until early 1850 when the Rev. James Slattery, who was an assistant to Father Skopez in Fryburg, came. Father Slattery was also the pastor at the “Wilderness,” in Farmington Township. Father Slattery recorded the first baptism in the parish on August 1, 1851. Baptized was Henry Hummer, born July 18, 1851, at Helen Furnace, the son of John and Barbara Hover Hummer. The Godparents are entered as Henry Nugler and Elizabeth Threadenlogh. Other baptisms that year were Jacob Martin in August, Jacob Good in September, Sara McKenna and Maria Teresa O’Leary in October. Father Slattery also officiated at the first marriage in the parish on January 15, 1852, that of Thomas McCarthy and Bridgetta Babbit. On July 29, 1853, the Erie Diocese was formed from the Northern section of the Pittsburgh Diocese. Bishop Michael O’Conner requested and became the first Bishop of Erie. The Erie Diocese was the third Diocese formed in Pennsylvania. On February 18, 1854, Josue M. Young replaced Bishop O’Conner as he returned to Pittsburgh. With Father Slattery in charge in 1855, active measures were adopted for the building of a church at Clarion. The various missions responded in a most generous manner for the time. Redbank Furnace contributed $110 dollars, Kops Settlement $45.50, Callwell’s Furnace $15.00, Wilderness $12.00, Sligo Furnace $104.00, Churchville $10.00, Prospect’s Furnace $62.50, Polk Furnace $40.00, Monroe and Washington $30.00, Black Fox Furnace $27.00, Catfish Furnace $12.50, America Furnace $31.00, and last but not least Madison Furnace $45.00. What was contributed by the people of Clarion cannot be ascertained as to the accurate account. Rev. James Slattery did not see the fulfillment of his efforts in the building of the church, for the records show that he was succeeded on the fifth day of November, 1855 by the Rev. Leopold Pawlowski. Father Slattery took off for the Mission fields of Iowa. Father Pawloski’s notable achievement was to complete the work begun by Father Slattery. The money he found in the treasury was not sufficient for the building of the church, however, he must have had a hustling method of getting there, for the records of 1856 show that he collected money for the Clarion church in Philadelphia, Pittsburgh and Erie, Pa. Bishop Josue Young of the Erie Diocese contributed $221, Miss Mary Reid of Clarion $80.00, Charles Martin collected $100.00. Philadelphia collections netted $412.51, Pittsburgh $356.75, and Erie $300. Father Pawloski lived on a farm about one mile south of Clarion. In the spring of 1856 the church was completed. It was a modest little brick building, fifty feet long and thirtysix feet broad. The brick must have been home made brick from the looks of them. 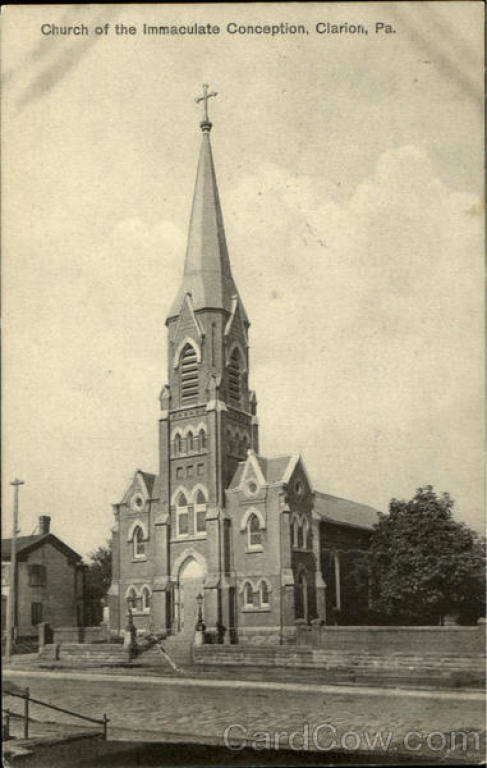 On Sunday, June 25, 1856 the first Catholic Church of Clarion was dedicated under the title of “Immaculate Conception of the Blessed Virgin,” by the most Reverend Josue M. Young D.D., Bishop of the Diocese of Erie. The dedication collection was listed at $61.56. For one more year Father Pawloski continued to serve this parish, when on June 25,1857 the Reverend Andrew Skopez, former pastor of St. Michael’s in Fryburg, arrived to take charge of the Clarion parish. One report has Father Skopez in charge of both parishes at this time. He was one of the zealous pioneer priests who in their missionary work covered so much territory that they must have forgotten where their actual home was. On June 22, 1859 Reverend Suibert G. Mollinger was sent to assist Father Skopez in the administration of the Parish until the end of his pastorate March 31, 1860. Rev. Mollinger’s stay in Clarion was not of long duration, lasting just over one year. On July 1, 1860, Father John Koch became pastor of Clarion. He also had charge of The Wilderness (Crown), Vogelbacher (Lucinda), Sligo, and other points in the Clarion vicinity. He is remembered as a small man of weak frame, simple and kind hearted. It was under his charge the shelllike church building was furnished with pews, organ, belfry and bells. The first and greatest concern, and that for which he is best remembered, was to bring education to the young people of his little parish. Accordingly he opened a small school in the sacristy of the church. On April 19, 1861, the church property was enlarged by a gift from J.C. Reid of the adjoining lot No. 21 on Main Street. The first School was built in the summer of the mid 1860’s. The church books of February, 1871 show for the first time a church committee consisting of attorney, B. J. Reid and Leopold Guth and F.X. Guth, who were jewelers. A third adjoining lot on Main Street No. 22 was purchased on July, 9 1872. In the early 1870’s, a Society of the Living Rosary was established by Father Koch. Mrs. A. Fillinger was the first President and there were 89 founding members. The object of the society was to awaken devotion to Jesus and Mary by daily meditating upon a principal event of joy or sorrow or glory in the lives of Jesus and Mary and to venerate Mary as Mother of Jesus. Obligation of members: First to recite every day one decade (15th part) of the rosary, and to make the required meditation. Second is to pay monthly ten cents and attend if possible the meetings on the third Sunday of every month. First. In case of the death of a member, six masses are offered for the repose of her soul. Second. Annually during “All Souls Week” one mass is offered for all deceased members. Third. The altars in the church are furnished with the necessary linens and ornaments by society money. Fourth. All surplus money is used for the benefit of the church. September 1, 1876, saw the advent of Father August H. Deckenbrock, whose name will be ever gratefully remembered in our history of St. Mary’s Immaculate Conception. He will be cherished in the most respectful manner by all. He brought with him sound principles, correct methods and a thoroughness such as has distinguished his priesthood, especially his last few years. In 1877 Father Deckenbrock, while pastor, also taught in the school. Father is credited with building the first parish rectory on lot No. 272, which he purchased on February 22, 1879. Later in 1887, he enlarged the rectory property by the purchase of Lot No. 273 on December 14, and finally the third adjoining lot on April 7, 1893, Lot No. 271, all of which front Liberty Street. Owing to the gradual growth of the congregation, the Church building that was erected in 1856 had become entirely too small in the latter part of the seventies. Apparently the lack of funds forced the people to bear with this inconvenience. In 1884, the space was utterly inadequate and nothing remained but to build an entirely new church, or reconstruct the old building. The latter plan was considered the cheaper, and was accordingly adopted. From 1886 to 1890 he remodeled and extended the old substantial but very plain brick church, raising the ceiling, adding to the church a very respectable, neat cut stone and brick transept like front with a suitable new tower and spire, and extending the rear, joining a new elevated and handsome sanctuary to the rear of the old church building in such a happy way as to make whole old and new structure appear as one original design. Stained glass windows were installed and an elegant new altar was purchased. The addition of the front facade gave the Church the appearance it would have until it was razed in 1977. On September 21, 1890, the project was complete, and a short time afterward was dedicated by Right Reverend Tobias Mullen, D.D., Bishop of Erie. Rev. Tobias Mullen, D.D. Bishop of Erie.